SO IT WAS A FUNNY COINCIDENCE, I thought, that one of the two ladies who arrived together and piled in next to me on the picnic bench happened to be named Claudia. Because where we were was also named Claudia—not the actual space, which was a shared kitchen/event space on the south side called Kitchen Chicago; more like the mental space, an underground dining experience called Claudia, put on by a chef named Trevor Teich with the help of one cook and a couple of professional servers. 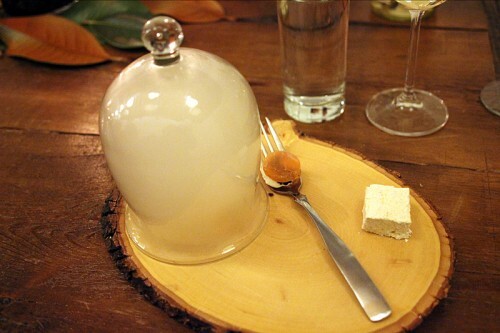 Our first course came out—though course is hardly the word for something consisting of smoke, gelatin, marshmallow and a little bit of salmon, that didn’t even arrive on a plate in the conventional sense (it arrived on a block of wood, with the smoke in a glass bell over the gelatin). Our first act, our first performance art piece—something like that would be a better term. Trevor Teich had sought me out to learn out about the restaurant named for his mom, and we met once for coffee and talked about what he did. 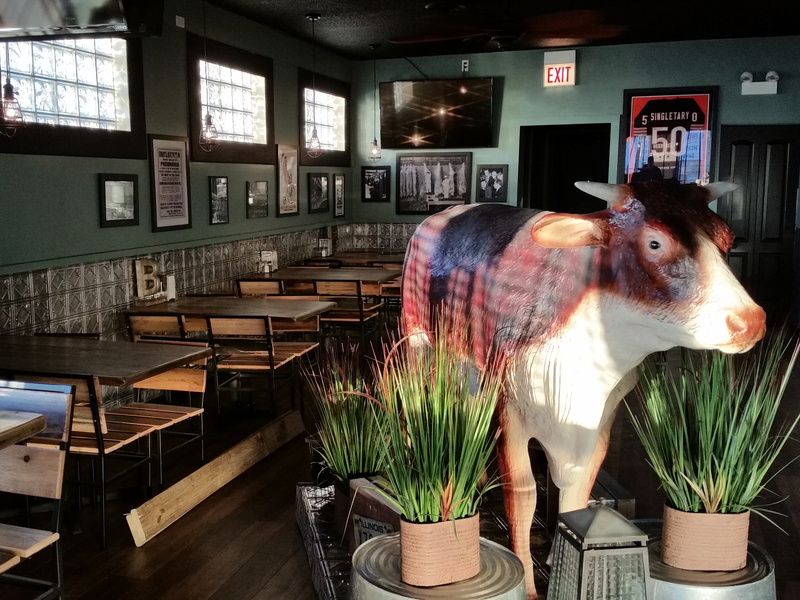 Then we met accidentally another time at his day job—at the Sur La Table at North and Clybourn. I decided to pay my own way to a Claudia dinner less because I needed another dinner of dots and squiggles than because I liked his spirit. He was confident enough of his skills to risk public embarrassment—I admire that. 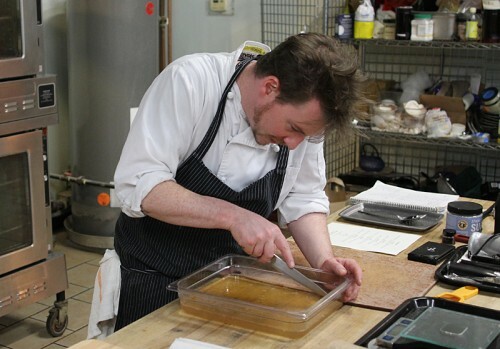 The boyish Teich is not as young as you might guess—he’s 34, and has stints at restaurants like L2O and Acadia in his background, but nonetheless, good for any youngish chef who decides to cut loose and do his own thing versus the conventional climb in other peoples’ kitchens. You’re bound to learn things you wouldn’t have otherwise, even if it’s a disaster. Don’t worry, Claudia. Claudia is no disaster. 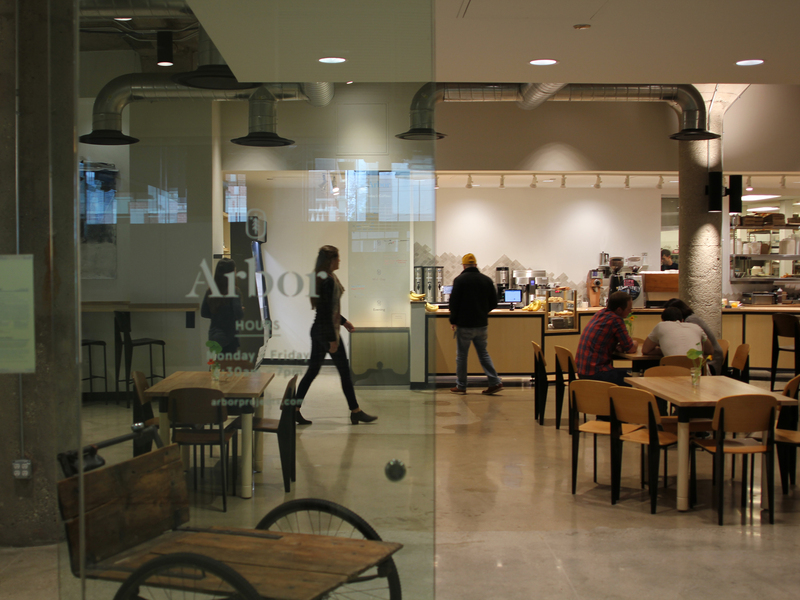 More than that, the dishes are accomplished—they’d certainly fit right in at Acadia, for one. Artfully plated, with a Trotteresque hint of Asian simplicity, they also manage a pretty high rate of flavors that stand out—I have a distinct memory of the pumpkin soup with seafood and a bright note of lime, and of a pork belly dish with multiple forms of potato which is pure comfort food pleasure, while the chocolate covered duck (that’s it in the cover image) draws oohs and ahhs from the entire room. I was a little worried that the dad of the family that arrived late would be the archetypal doesn’t-get-it guest who ruins the tasting menu for everyone else, but he was won over quickly by the lushly pleasurable soup. There was a good vibe in the room. 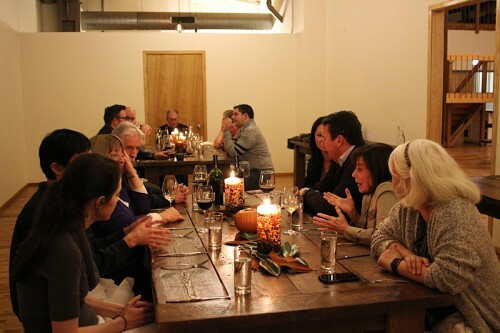 That’s the other part of the tasting menu experience that can especially be a risk for underground dinners—that it will be an airless room full of strangers awkwardly waiting for a few tiny bites at a time for hours. 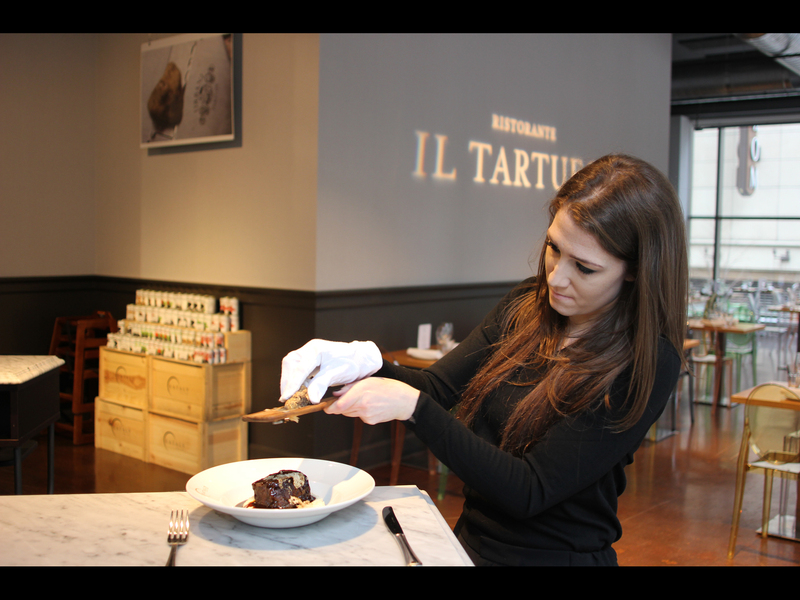 After doing dinners for a few months, Teich got a call out of the blue from Daniel Drake, a former trader who has been a server at restaurants like Sixteen and Carnivale but is also a devotee of fine dining in general. “He said you need me, and I said, ‘Who the hell are you? '” Teich explains. We’re on the west side, just a few blocks north of the dividing line between north and south, but when I ask Teich about Claudia’s future, he hopes for opening a permanent restaurant farther north, such as in Lincoln Square—he’s from the north shore, and he likes the idea of being close enough to draw customers from the northern suburbs. 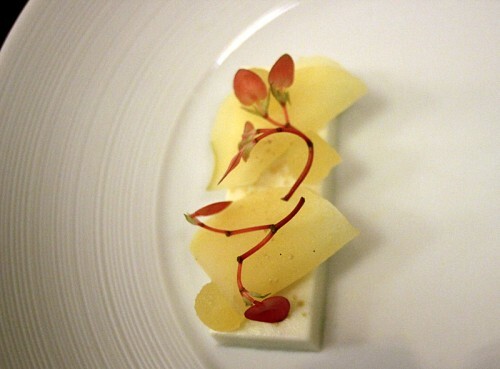 There’s really no high-end modernist restaurant north of the city at this point, though it wasn’t that long ago that Evanston was home to Trio—and its young French Laundry-trained chef, Grant Achatz. Claudia actually started in Evanston—at a short-lived popup space called Company, where 42 Grams’ Jake Bickelhaupt also did an early popup. (Bickelhaupt and his wife Alexa were at the dinner that night, curious after reading an article that called Claudia “the next 42 Grams.”) He did another at Hofherr Meat Co., an artisan butcher shop in Northfield where he and the owner, Sean Hofherr, knew each other growing up (“I went to Sunset Ridge, he went to St. Phillips,” he says to answer the most important question for a North Shorian). He’s been resident at this kitchen space—mainly used during the week by food trucks—for about a year; when the whole hall was too pricey for him, he looked at a what was basically a storage space and said, “If you clean that out, I could make a nice dining room out of it.” Having a settled space for a while allowed him to experiment in other areas—for instance, out of the blue a few months back he contacted James Beard Award-winning pastry chef Michael Laiskonis, formerly of Le Bernardin, and they wound up collaborating over email on a dessert that Teich executed. Especially if your mom is at Claudia that night. Claudia will have two nights of service this month, on Friday, December 4 and on Sunday, December 13. Go to claudiarestaurant.com for details and tickets. 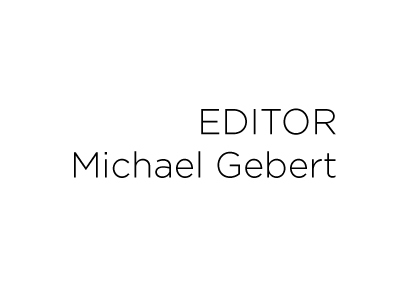 Michael Gebert is editor of Fooditor, which is named for his mother.